316L premium stainless steel construction. Cone shaped dual screen basket provides even greater straining area. Basket is removable for easy cleaning. Lid is removed by simple one hand grip knob. No wingnuts! Lid will withstand 100 PSI pressure spikes. Kit includes polished billet aluminum swirl lid cover! Dual 1-1/4" NPT inlets and outlets. 3/4" NPT pressure relief port. Kit includes pressure relief valve. 360 degree swivel mounting bracket for maximum mounting flexibility. Due to differences in mounting surfaces, hardware for mounting strainer not included. See Additional Info for extended product details. You Save: 8% off MSRP! It seems as though we usually find that no matter how great some products are there always seems to be some sort of short coming - until now. Hardin Marine has taken a relatively simple product and refined it to perfection. Many sea strainers just simply strain seaweed or debris from the raw incoming water, unfortunately use of these units usually is so hindering due to the need of wrenches, poor accessibility, flat screens that drop most of their debris when removed. These "NEW" Hardin Marine sea strainers have solved it all. Starting with the very best in construction the use of 100% 316L Premium Grade stainless steel. The heart of these units though is their unique cone shaped strainer basket. This unit allows greater strained water surface than all other brands, while the design of the basket actually chews up debris in the process almost acting as a self-cleaning type of unit. Monitoring the sea strainer is a snap a 100% Lexan lid (not imitation plastic) allows clear view of when to clean the unit out, the Lexan lid will withstand water pressure spike in excess of 100 PSI without failure. But the best part is still the ease of use just one hand will remove the large easy to grip knob, no wrenches, wing nuts or bolts here as the lid is removed the o-ring seal is captured to the lid so you won't be searching for it like other units. The cone shaped strainer basket then slides out capturing all of the strainers contents, most units have an non-removable screen that you haveto scoop out by hand. 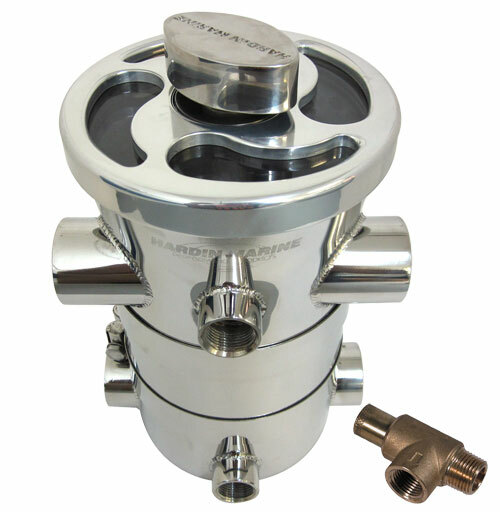 Each assembly features dual 1-1/4" NPT inlet and outlets along with 3/4" NPT pressure relief port. A 360° swivel bracket allows mounting convenience in all applications.